Snowdrops (above) may be naturalized in the lawn or planted close to the entryways to your home so that you can enjoy them in late winter. I planted mine in a bed of hellebores and hostas. They complement the hellebores in late winter, and their dying foliage is hidden by the hosta leaves unfurling in late spring. Erythronium can be massed, planted with other spring bulbs, or with woodland wildflowers. Daffodils can be naturalized in the lawn, but the foliage must be allowed to die back naturally before cutting. A meadow area is best for this. I interplant daffodils with daylilies. As the daylily foliage grows, it hides the yellowing daffodil leaves. I also moved my forsythia and PJM Rhododendron shrubs so that they back my spring garden, and echo the yellows, blues and violets of the perennials and bulbs. Species tulips bloom in April, and last many years in the garden. 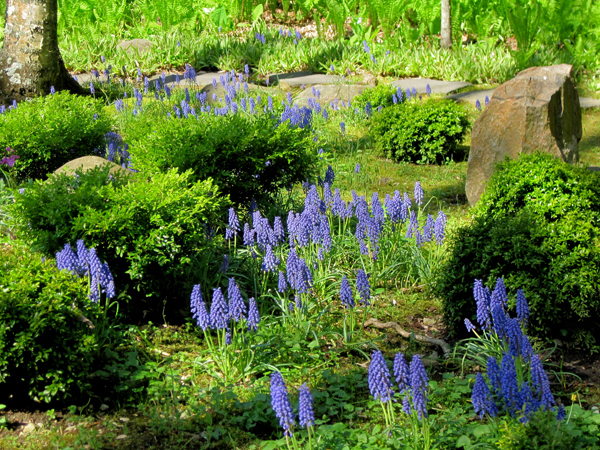 They look fabulous massed, and interplanted with grape hyacinths. In my garden, they are backed by chives, which provide spring blooms in the garden and are a staple in my cooking. Alliums complement the blues, violets and yellows of my spring garden. I love the giant 'Gladiator' and 'Globemaster' varieties. As a bonus, they are not eaten by voles or rabbits. Above, Alliums provide spring color to the daylily border at the back of my house. With so many colors and varieties of tulips available, selecting a few for your garden can be overwhelming. Thinking about companion plants can help. Above, variegated red-twig dogwood is beautifully accented by white and purple tulips. Every year there is at least one new plant that I discover and just have to add to my garden. Last spring, as my friend Joan and I were sorting through photos for our spring ephemerals lecture, a photo of her Lathyrus vernus caught my eye. Joan’s recommendation of the plant just fueled my “plant lust” and I was on the lookout to add this unusual perennial to my own early spring garden. Also called “spring vetchling,” lathyrus vernus is a non-vining perennial sweet pea – a multi-stemmed, clump forming plant with a bushy habit that grows to about 12” high. It bears showy sweet pea-like flowers, which range from a rich reddish purple to bubble-gum pink, and become violet-blue as they mature. The flowers hover above light green leaves. In bloom, lathyrus looks like a charming bouquet of sweet peas in the garden. Lathyrus blooms for three to four weeks in April– about the same time as mid-season Narcissus and hellebores. Since it prefers light shade, it is a perfect addition to a spring woodland garden and combines beautifully with primroses, pulmonaria, and early spring bulbs. After blooming, the flowers turn to dark seedheads, and once the seeds drop, they become coffee-colored spirals. The foliage remains on plants planted in shady, moist locations, but may die back in sunnier and drier settings. Once established, lathyrus is fairly drought tolerant. It’s a plant that does not like to be moved, so choose it’s home carefully before you take it out of the pot! Hardy to Zone 4, lathyrus is a low-maintenance perennial that plays well with others, and does not ask for any attention from the gardener. Once I had lathyrus vernus on my radar, I knew I had to add it to my own garden. But this perennial can be hard to find. Like many other early spring beauties, lathyrus doesn’t look like much in a nursery pot, especially when not in bloom, so it is not sold in many nurseries. Last May, as I was touring gardens in the New York, I started seeing it everywhere –at Stonecrop Gardens, at the Brooklyn Botanic Garden, and at private gardens of the Hudson valley. And to my delight, I found an unlabeled pot of it at a delightful nursery called Rudolph Gardens in Carmel, owned by a wonderful gentleman whose love of gardening grew into a home-based business for his “golden years”. Now that spring is finally here, I’m on the lookout for those bright pink blooms in my own woodland garden! If you cannot visit Rudolph Gardens (www.rudolphgardens.com) this year, you can find lathyrus vernus at Arrowhead Alpines, www.arrowheadalpines.com. During my first visit to Monticello last month, I came across a wonderful book that piqued my interest in native plants. Andrea Wulf’s highly engaging The Brother Gardeners brings to life the science and adventure of eighteenth-century plant collecting, beginning with colonial farmer John Bartram who started shipping seeds of our native plants to English collectors in 1733. English plant lovers were entranced by the hundreds of unusual American trees and shrubs, from magnolias and firs, to rhododendrons and mountain laurels, to the wildflowers of the woodlands and prairies. Since Bartram lived in Pennsylvania, one of the perennials that he must have sent to England was our native Mayapple, Podophyllum peltatum, which is currently blooming in my garden. Mayapple is yet another spring ephemeral – a perennial woodland wildflower that blooms early in the spring (May in Massachusetts), sets seed and then disappears by midsummer. Native in eastern North America south to Texas, Mayapple is hardy from zones 3 to 8, and makes a lovely addition to the woodland garden. The plants poke out of the ground looking like shiny little folded umbrellas, and then quickly unfold. From a single stem, each plant grows 12-18” tall, and produces one or two umbrella-like leaves that may be up to 12” in diameter. The leaves are deeply-divided, and a mass of Mayapples looks like a grove of miniature palm trees. The 2” blossom is usually hidden by the large leaves, so you have to get down low to appreciate its delicate beauty. After the flower is pollinated by bumblebees, each plant produces a fleshy, greenish lemon-shaped fruit (the apple) which turns golden when ripe. The fruit can be used for preserves and jellies, and apparently tastes like an overripe melon. However, since the rest of the plant—the leaves, roots, and unripe fruit—is highly toxic, I have not sampled it myself. Mayapples are best grown in partial to full shade, in rich, well-drained, humusy soil. They will tolerate dry soil and drought once established. The plants colonize by underground stolons, forming dense mats. They do not like heavy competition from other plants. Although it is recommended that they be grown under deciduous trees, mine are growing well under the canopy of 75-foot tall Norway spruces. They are toughing it out in the company of mammoth hostas, bloodroot and Christmas ferns. Mayapples may be propagated by root division while dormant in the fall. Each new division should have at least one bud. The plants will also self-sow in optimal growing conditions, but seedlings take several years to mature. Like trilliums, Mayapples should be enjoyed them in the garden, not in a vase. Picking the flowers is impossible without cutting the leaves as well, and the plants need the leaves to supply fuel for next year’s growth. For gorgeous displays of Mayapples and other native woodland wildflowers, visit Garden in the Woods this month, the Framingham, Mass. home of the New England Wildflower Society. In addition to special programs, Garden in the Woods offers many unusual plant cultivars for sale, and is a great place to start your own native American plant collection. After a week of much-needed spring rain, the garden looks lush and expectant. Everywhere, there seems to be a new wonder to appreciate and admire. Hosta leaves unfurl, the blossoms of the crabapple trees are buzzing with bees, and the arching stems of old-fashioned bleeding heart are lined with dangling blooms. And, hugging the ground, a drift of dwarf crested iris offers delicate charm. Dwarf crested iris (Iris cristata) is a small iris, less than 6 inches tall in bloom, with 2- to 3-inch wide flowers that hover just above its blade-shaped foliage. It spreads by creeping rhizomes, eventually forming a dense groundcover. It is one of the most common of the irises that are native to the northeastern United States. It can be found growing on stream banks and on wooded slopes or rocky bluffs in its native habitats. Despite its delicate appearance, it is a tough little plant that is extremely hardy (Zones 3-9). Most people are familiar with the tall bearded iris. The flowers of the dwarf crested iris are beardless. They are very showy, with three narrow petals and three broad, down-curved sepals. The sepals are centrally marked with a yellow or white band, with a crested ridge and a white splotch. Flower color is typically shades of blue-lavender, deep violet or white. Iris cristata ‘Alba’ is the white form of the dwarf crested iris. The flowers are a particularly bright white color that is outstanding in moon gardens. Its softly spiky form and clear color enhance other garden plants. I have planted it in front of a yellow-leaf bleeding heart (Dicentra ‘Gold Heart’), a green-edged yellow Hosta (‘Golden Meadows’) and a dark pink azalea (‘Renee Michelle’); just dazzling. Other garden-worthy Iris cristata cultivars include the dark purple ‘Navy Blue Gem’ and ‘Eco Purple Pomp’, the light blue ‘Powder Blue Giant’ and the ruffled blue ‘Shenandoah Sky’. Dwarf crested iris prefers well-drained soil with moderate fertility and moisture. It will tolerate drought once established. It performs well in sun or shade, but does best in part-shade. When planted in sun, it requires extra moisture. Its ability to perform well in shade increases its usefulness. When planted in both sunny and shady areas of the perennial border, it helps create unity through repetition. At the shaded end of my mixed border, I have planted it amongst ferns, Epimediums and hostas (H. ‘Yin’ and H. ‘Allegan Fog’). In a sunnier location, it keeps company with assorted campanulas, Heuchera ‘Venus’ and Sedum ‘Autumn Joy’. Dwarf crested iris is an excellent plant for the home garden. It is lovely planted along the edge of a path or perennial border. It will naturalize in woodland gardens, where it will produce great swaths of springtime color. Like all irises, it is deer resistant. It will grow and bloom in dry shade. To many gardeners, the name phlox conjures up images of a fragrant perennial in the sunny mid-summer border. There is another phlox, however, Phlox divericata, that creates a cloud of shimmering blue and violet in woodland shade. Woodland phlox is a delightful spring-blooming native that forms a creeping mound about one foot tall. As the common name suggests, it is a woodland wildflower, growing in forests, fields, and alongside streams. It prefers light to full shade, moist soil and a summer mulch of shredded leaves or bark. The foliage forms a mat of loosely entwined stems with semi-evergreen oblong leaves. The stems are both hairy and sticky. Although its foliage does not have a strong presence, Woodland phlox makes up for this with ethereal drifts of flowers, in hues ranging from sky blue to violet, to rose and soft white. The sweetly scented blooms are formed in loose clusters of tubular flowers, each up to 1.5" wide, with five flat, notched, petal-like lobes that appear at the stem tips. Woodland phlox is a natural mingler, chatting its way across the woodland floor. It weaves in and out of neighboring flowers, complementing spring flowering bulbs and providing a carpet for taller perennials. As the leafy shoots spread along the ground, they root at the nodes, creating nice colonies. It is a great plant for naturalizing since it also self-sows to create soft drifts that blend well with other woodlanders. Woodland phlox is what landscape design guru Piet Oudolf would call a “filler plant”. Plants are either “structure” or “filler” plants depending on their form, shape and texture. Structure plants have outspoken personalities that dominate their neighbors, while filler plants, which lack a strong presence of their own, weave around the others and fill in gaps. Filler plants like Woodland phlox, with its creeping form and soft hue, are vital to the garden, creating a seamless flow in the overall design. Desirable cultivars of Phlox divericata include ‘Clouds of Perfume’ with its pronounced fragrance and powder-blue flowers; ‘May Breeze’, a soft-white phlox introduced by Piet Oudolf, and ‘Blue Moon’, the favorite dark blue selection of Bill Cullina, curator of the Coastal Maine Botanical Garden. Erythronium: What’s in a Name? Every spring, there are a few new plants on my “plant lust” list – plants that I have read about or seen and just have to add to my garden. This year, the spring flowering Erythronium is high on the list. Depending on what part of the country you’re from, you may know Erythronium by a different name – perhaps Adder's Tongue, Dogtooth Violet, Trout Lily, Glacier Lily, Serpent's Tongue, Deer Tongue, or Yellow Snowdrop. Whatever you call them, the 25 species of Erythronium are among the earliest of our native lilies to bloom in the spring. Most of the species are native to Western North America but there are also a few native to the Northeast and to Eurasia. These long-lived plants can be found in deciduous woodlands, sometimes in sizable colonies that can be up to 300 years old. They grow with other spring ephemerals such as Trillium, Hepatica and Uvullaria. Erythronium’s distinctive silver or brown-mottled leaves basal leaves resemble the coloring of brook trout, hence the common name “Trout Lily”. Plants typically grow 6-12” tall. Their single, nodding bell-shaped flowers somewhat resemble violets. The flowers may be white, yellow or pink, depending on the species. Petals and sepals are bent backwards exposing six brown stamens. Erythronium’s flowers may last ten days to three weeks, depending on the temperature. The leaves last into June as the bulb goes dormant. They should not be removed until completely dried up, as they provide nourishment for the underground corm. Some of the more common species include Erythronium americanum (Trout lily,) with yellow flowers tinged with red, Erythronium albidum (White Dogtooth Violet), and the widely-available native hybrid 'Pagoda' which sports 3-5 flowers per stem in a rich yellow with a contrasting central reddish eye ring. In the garden, Erythroniums will readily hybridize if you plant two or more species together, yielding new combinations of flower color and foliage pattern. Although Erythronium may be grown from seed, they will not flower for 4-5 years. Quicker and better results are obtained from planting corms, which are sold by many bulb suppliers and nurseries. The tiny white corms have a tooth-like shape, which lead to the common name “Dogtooth Violet”. Like other spring-flowering bulbs, Erythronium corms should be planted in fall, 2-3” deep and 4-5” apart, and mulched well. The corms will produce stolons, and new plants will slowly spread to form large colonies if left undisturbed in optimum growing conditions. Offsets from mature plants may also be harvested and planted to increase your supply of these lovely plants. Erythronium grow best under deciduous trees in a deep, fertile loamy soil. They should not be planted where the soil remains wet, as the corms may rot. They can also be naturalized in thin lawns or grown in shrub beds around rhododendrons and other part-shade lovers. Erythronium are beautiful additions to the early spring garden, and combine well with species tulips, epimedium and other early bulbs. Since their foliage disappears for the summer, they can be planted where later growing perennials will take their place. I am looking forward to adding these woodland lilies to my shady border and enjoying their elegant blooms next spring. We are all familiar with the grand Dutch hybrid tulips that grace our gardens in late May, and were the cause of the “Tulipmania” frenzy in Holland 400 years ago. 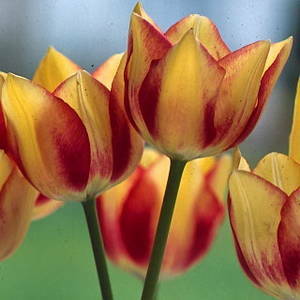 But the parent cultivars of those tulips, less well-known but equally beautiful, are the “species” or “botanical” tulips. Smaller and simpler than hybrid tulips, species tulips delight the gardener with vivid colors, diverse forms, interesting foliage and arresting fragrance from early April to early May. I had always thought that tulips came from Holland, and it wasn’t until a trip to Istanbul ten years ago that I learned that they are actually indigenous to Central Asia. Tulips have been cultivated in Turkey for almost one thousand years, and were brought to Europe by an Austrian ambassador to the Turkish Empire. European gardeners saw a resemblance between the flower's shape and Turkish headwear, and dubbed the flower "tulipan", from "tuilbend", the Turkish word for "turban". Tulips were favored by Ottoman sultans, who staged poetry and musical evenings in their expansive tulip gardens, illuminated by candle lanterns on tortoise backs. The reign of Sultan Ahmed III (1718-1730) is in fact called the “Tulip Era,” an era of peace and tranquility, when tulips enjoyed particular popularity in the arts and folklore. Tulips are still widely used to embellish tiles, ceramics and textiles today, and I happily brought home a souvenir tile set decorated with a tulip motif. Species tulips still grow wild in the mountain ranges, gorges and remote meadows of Central Asia, but they also thrive in the US zones 4-7, preferring areas where winters are neither too warm or too wet. They prefer full sun and excellent drainage. Unlike hybrid tulips, they are hardy and long-lived. Because they thrive in poor soil and rocky areas, species tulips are a classic choice for rock gardens. They look wonderful planted in casual drifts in the woodland garden or combined with other spring bloomers such as grape hyacinths, windflowers and small early daffodils at the front of the perennial border. Species tulips should be planted in groupings of at least 6 bulbs for best effect, and each bulb should be surrounded by sharp sand during planting. This provides the drainage that they demand and protects the bulbs from tunneling rodents. With more than 150 cultivars offering a wide range of colors, sizes and interesting foliage, it is easy to develop your own “Tulipmania” for species tulips. 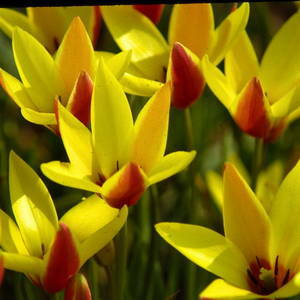 Some of the most popular include Tulipa kaufmanniana, the Waterlily Tulip, whose flowers open wide to form six-pointed stars, and T. fosteriana, a bright red species that is widely available. 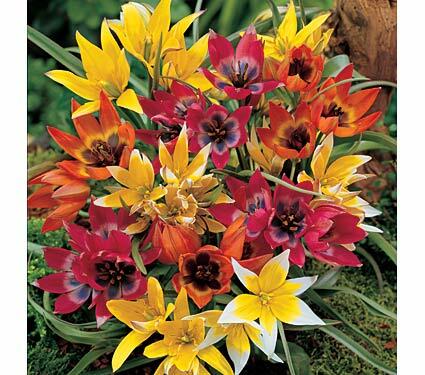 Other notable varieties include T. tarda, with white star-shaped blooms and bright yellow centers, T. clusiana, the Peppermint Tulip, with creamy white and red striped petals and T. pulchella, a small early bloomer. For exotic looks, you can’t beat T. acuminata, the Fireflame Tulip, with its wispy, spidery, yellow and red petals. For fragrance, you can try T. sylvestris, T. marjolettii and the early blooming T. batalini, with its pointed buds that resemble a wizard’s cap. The greatest selection of species tulips can be found in the fall from mail-order bulb nurseries, including johnscheepers.com, vanengelen.com and brentandbeckysbulbs.com. There are hundreds of species of flowers that are native to the woodlands of northeastern North America, and nearly 90% of them bloom in the spring. Spring ephemerals are among the first of the woodland plants to emerge, allowing them to take full advantage of the available sunlight, moisture and nutrients of the forest floor. This gives them a head start in the race to fulfill the biological imperative of all flowering plants: the production of seeds for the continuation of the species. However, blooming so early is not without risk. It requires unique evolutionary strategies and adaptations. Many spring ephemerals have developed complex relationships with other organisms in their eco-niche that encourage successful pollination and seed production. In addition, many have specific physical and structural characteristics that give them advantages in the potentially harsh conditions of early spring. Spring ephemerals are small plants. The forest floor thaws from top to bottom, so water and nutrients are available in the top level of the soil first, allowing smaller plants with their shallow root systems to become active before larger plants. This gives spring ephemerals a competitive edge in successful flower and seed production. Many spring ephemerals have physical characteristics that offer protection during the cold nights of early spring. Bloodroot traps warm air with its thick leaves that envelop the flower bud and the flower stem, shielding them from frost. Other plants, such as Hepatica, have stems that are covered with dense hairs that resemble a fur coat. The hairs prevent ice condensation and act as insulators, thus protecting very early bloomers from damaging frosts. Some woodland plants bloom before most pollinators are active. For example, skunk cabbage blooms so early that the only insect pollinators available are flies. The fetid odor of skunk cabbage is an adaptation designed to attract flies and ensure pollination. Hepatica is another early bloomer, with blossoms that span the time of available pollinators. Hepatica relies on flies as well as early bees, beetles and moths for pollination. Our native bumble bees are essential to the reproductive success of many spring ephemerals, such as Dutchman’s breeches. Many woodland perennials rely on wind, or birds, or water to spread their seeds. Others, like bloodroot and trilliums, have their seeds spread by ants, a process called myremecochory. Ants gather the seeds and store them in underground nests where they feed upon a fleshy appendage attached to each seed. In this way, the ants essentially plant the seeds in an environment where they stay protected until they germinate the following spring. A single ant colony may collect over a thousand seeds in a season, but they do not move them a great distance. In general, a seed is carried no more than two meters from the parent plant. Because offspring and parent plant remain in close proximity, their existence is easily threatened. When their habitat is disturbed or they are removed from the woodland (by changing environmental factors and human or animal activity), it is rare that they recur. After a long winter, foraging deer are fond of fresh new plant growth. Most spring ephemerals have developed adaptations that make them unpalatable to deer, including hairy stems and leaves, and poisonous sap. Spring ephemerals and other early-blooming woodland perennials have developed ecological strategies for flowering, pollination and seed production that are completely reliant on the seasonal cycles of our native woodlands, on the growth patterns of our native plants, and on the availability of our native pollinators. In spring, our woodland floors are carpeted with the blooms of wildflowers that are wondrous examples of the complex inter-relatedness of the natural world. My husband’s Uncle Charles is an avid outdoorsman who loves to hike and canoe all over the country. At the young age of 81, he is constantly conquering another river, portaging his canoe over landmass obstacles or encountering a bear in the campground of a national park. When we started writing our gardening articles last year, I learned that he is also an avid naturalist, and has been photographing our native wildflowers for years. I had just recently become interested in spring ephemerals, and knew most of them only from friends’ gardens. It was a thrill to see his photos of Hepatica, Bloodroot, Trilliums, Erythronium, Jeffersonia, Uvullaria, Jack-in-the-Pulpit, and Phlox captured in their forest habitats throughout the U.S. and Canada. For those of us gardening in northern climates, spring ephemerals stretch the gardening season with their early blooms. Many spring ephemerals are native to our North American woodlands, where springtime begins slowly and ends with a crescendo of blossoms that carpet the forest floor in May. These early wildflowers can be effective and adaptable additions to the home shade garden. You will be surprised at the number and variety of cultivars of our early spring bloomers: 40 species of trillium, 20 species of erythronium, more than 100 cultivars of hepatica, to name just a few—there are ample opportunities for collectors! Quick Growth Cycle. Spring ephemerals are perennial wildflowers that develop their aerial parts - stems, leaves, and flowers - early each spring and then quickly bloom, go to seed and die back to their underground parts (roots, rhizomes, and bulbs) for the remainder of the year. Many emerge in April and are completely gone by June. Forest Dwellers. In early spring, the forest provides a warmer habitat than open field. Trees absorb the heat of the sun with their trunks and slowly radiate this heat to the air at night, when frost is still a threat to small plants. Until the trees leaf out, the sun’s rays can thaw and warm the soil of the forest floor. Trees also act as a windbreak, reducing the “wind chill” factor in the woodland. Reaching for the Light. Spring ephemerals take full advantage of early spring sun by blossoming before the forest trees leaf out. Moisture Lovers. Early spring is also the time of year when soil moisture is at the highest because the trees are not actively soaking up all the available water. Early Feeders. Soil nutrients are at their highest levels in early spring, when decay of the previous year’s leaves produces a bumper crop of nutrients in the soil. The spring ephemerals have first crack at this abundant food supply. Early to Bed. Once the leaves of taller plants expand and command the light and water, the ephemerals simply go dormant. Reserving the nutrients they gathered in their tubers, rhizomes, or other underground storehouses, they wait quietly until they can be “early to rise” the following year. So if you want to add beauty and interest to your early spring gardens, look for the spring ephemerals that will enchant you with their woodland wildflower magic. When we bought our 90 year-old house in the suburbs, I anxiously awaited my first spring to see which flowers would emerge from the ground. After all, many generations had owned the property. Surely there would be a few long-lived peonies, some daffodils, bleeding hearts, and other “heirloom plants.” The property was graced with beautiful mature trees and a few overgrown shrubs, but there were no discernible flowerbeds. Grass grew right up to the stone foundation. To my surprise, there were only two perennials that had survived the years of garden neglect and emerged that first year – plain green hostas and Siberian squill. Siberian squill (Scilla siberica) is a true harbinger of spring, emerging in the garden even before the crocuses. It is one of more than 100 species in the genus Scilla that are native to Europe, Asia and Africa. Despite its name, Siberian squill is not native to Siberia, but is found in other parts of Russia, and has been cultivated since the 1790s. I love to look for the dark purple shoots of squill poking out of the ground – to me it’s a sure sign that the garden’s cycle of bloom has begun. Each tiny bulb produces dark green, grass-like foliage and 3 to 5 flower stalks that sport the bluest of blue flowers. The plants themselves are only about 6” tall. Each bell-shaped, nodding flower, has 6 blue petals and blue anthers. Its lovely floral scent attracts pollinating insects. The fertilized flowers form round green seed capsules and eventually release a multitude of tiny brown seeds. In no time at all, you have a carpet of beautiful blue flowers. Like other spring bulbs, squill’s foliage dies back in early summer and I simply cover it with mulch. The plants remain dormant until the following year. Siberian squill requires no care after planting. It grows best in partial to full sun, in soils with good drainage and plenty of organic matter. Bulbs should be planted in the fall, 2-3” deep and 2-4” apart, and they look wonderful massed in drifts of 20 or more. Mine have slowly spread by seed and bulb offsets and now appear in several flowerbeds. They are perfect bulbs for naturalizing in the lawn or under deciduous trees and shrubs. By the time that the trees and shrubs leaf out in the spring, the squill are entering dormancy and no longer require as much light. I also love the fact that squill is not a preferred food for voles, chipmunks, rabbits or deer. Voles and chipmunks have decimated many bulbs and perennials in my garden lately, and it’s a relief to find plants that they naturally ignore. Siberian squill’s intense blue color looks wonderful when massed under a pink- or white-blooming ornamental tree or shrub that blooms at the same time, such as Amelanchier, Viburnum bodantense, or some of the early flowering cherries and small-leaved rhododendrons. It is also lovely when paired with other early blooming bulbs such as miniature daffodils, species tulips, giant crocus and glory-of-the-snow. No matter where it is planted, Siberian squill will delight you each spring and live on in your garden for many generations to come. One of the most well-known and well-loved of the spring ephemerals is the old-fashioned Bleeding Heart, a graceful ornamental with rose-pink, nodding, heart-shaped flowers hanging off of arching stems. Bleeding Heart’s unique blooms delight children, and the plant’s elegant appearance enhances cottage gardens and shady retreats. Bleeding Hearts (Dicentra spectabilis) are native to northern China and Japan, and were discovered and brought to England by a plant explorer of the Royal Horticultural Society in 1846. The name Dicentra was derived from the Greek dis (“twice”) and kentron (a “spur”), in reference to the two hooks on each bloom, and spectabilis refers to the plant’s “showy” or “spectacular” appearance. Although classified as shade plants, Bleeding Hearts grow best in light shade to full sun in New England. They thrive in humus-rich, well-drained soil, and will rot of the soil remains too wet. The plants grow in loose clumps, 3 feet tall and 4 feet wide. The reddish new foliage emerges from the ground in early spring and forms into powdery green leaves on fleshy stems. Bleeding Hearts flower in early May to mid summer, with each stalk bearing up to 15 individual flowers. The plants go dormant in mid to late summer and the yellowing foliage can be cut back hard at that time. The stems can be pulled out and discarded once they die back completely. Bleeding Hearts can be divided in spring or after they die back in late summer, but care must be taken with their brittle roots. With their graceful foliage and heart-shaped flowers, Bleeding Hearts make a spectacular show in the May garden with tulips and forget-me-nots, sweet woodruff and lily of the valley at their feet. Since the foliage dies back in midsummer, I have planted mine in areas where other perennials will fill in and obscure the yellowing foliage – in back of hostas, hardy geraniums and astilbe, which come out later in the spring to fill in as the Bleeding Heart declines. In addition to the common Bleeding Heart, there are several other noteworthy varieties including the all-white Dicentra spectabilis ‘Alba’ and the cherry-red ‘Valentine” with its ferny gray-green foliage. A real show-stopper is the recently introduced ‘Gold Heart’ with its bright yellow foliage and rose-pink flowers. Its long-lasting foliage virtually glows in the garden. Fringed Bleeding Heart (Dicentra eximia) is a beautiful choice for the woodland garden, with its ferny foliage, smaller size (about 12” high) and petite flowers. Though less striking than the spectabilis cultivar, eximia blooms longer, retains its foliage throughout the growing season and is available in pink, white or the new red ‘Burning Hearts’. The princess, realizing too late that she did love the prince, cried out, "My heart shall bleed for my prince forever more!" and her heart bleeds to this day. In May, the blooms of Tiarella carpet the woodland floor with a layer of foamy haze. The fuzzy flowers are held like little bottle brushes above green leaves that often are centrally marked with maroon. Until recently, Tiarella was only grown in home gardens that were devoted to woodland plants. Now, thanks to the work of plant hybridizers and a wealth of new cultivars, Tiarella has moved into the mainstream as a shade garden perennial. Tiarella, also known as foamflower, is a deer-resistant wildflower that is native to eastern North America and Asia. Hardy in Zones 3-9, it grows in deciduous woodlands and mountain terrains. It has attractive, low-growing, semi-evergreen foliage. Its leaves are heart-shaped or deeply lobed and are often dramatically patterned. In winter, the leaves darken to red and flatten to the ground. It produces flowers on leafless stems that can range in height from six to fifteen inches. Flowers can be white or suffused with pink. Roughly speaking, Tiarella can be divided into two types: ground cover and clump-forming. Tiarella cordifolia var. cordifolia is a ground cover that spreads fairly quickly by stolons or runners. It is a good naturalizer. The stolons produce plant offsets that take root and bloom in their second year. Tiarella 'Brandywine' is a cultivar with slightly lobed, hairy leaves with a central maroon splotch. It produces eight-inch tall, graceful white flower spikes that last for weeks. In my garden, it is a well-behaved ground cover that mixes with variegated Solomon's Seal (Polygonatum odoratum 'Variegatum'), 'Purple Lance' astilbe (Astilbe chinensis 'Purple Lance'), Hosta 'Abba Dabba Do', and ferns. Tiarella cordifolia var. collina is a clump-forming type. Often, the leaves are deeply lobed and resemble the leaf of a Japanese maple. Dark purple or maroon markings along the central veins of some of the cultivars create season-long interest. The flower spikes are usually densely packed and plentiful. The flowers last for weeks and have great impact in the spring garden. I grow T. 'Spring Symphony' and T. 'Iron Butterfly' in my gardens and wouldn't be without either one. Both have semi-evergreen slightly hairy leaves that form healthy clumps that are six to eight inches tall by twelve inches wide. Both look good for the entire growing season. T. 'Spring Symphony' is extremely floriferous, with dark pink buds that open to fuzzy pink flowers. As an added bonus, it occasionally sets seed. T. 'Iron Butterfly' produces fewer flowers, but has dramatic, deeply lobed leaves with strong markings of dark purple. Both add variety and beauty to my shade gardens as they share space with hosta, epimedium, ferns, and Toad Lily (Trycertis). Tiarella is easily grown in the home garden. It requires partial shade or full shade. It prefers humus-rich moist soil, but adapts to drier conditions once established. It is a low maintenance plant that is virtually pest-free and seldom needs dividing. Tiarella is useful in the garden as a ground cover or as a clumping perennial and looks lovely when paired with spring-flowering bulbs. It is a charming addition to the home garden. It lights up shady corners with its spikes of flowers and creates season-long interest with its intricately patterned foliage. Tiarella can be purchased locally at numerous garden centers including Weston Nurseries and from on-line sources such as Mason Hollow Nursery www.masonhollow.com. Springtime in the woodlands of eastern North America begins slowly and ends with a crescendo of blossoms that carpet the forest floor in May. Many of the earliest wildflowers in this succession of bloom can be effective and adaptable additions to the home shade garden. One such wildflower is our native twinleaf, Jeffersonia diphylla. Its flowers are fragile and fleeting, lasting only a couple of days, but they are a sure sign of spring. The delicate floral beauty and intriguing leaf shape of Jeffersonia make it a desirable plant for gardeners who want to try something new in their shade gardens. Jeffersonia diphylla is a clump-forming woodland perennial that is hardy in Zones 5-7. Its white, daisy-like flowers are one inch in diameter and cup-shaped. They are borne individually atop eight-inch, wiry, leafless stems. The flowers are followed by unusual pear-shaped seed pods with hinged lids. As the pod stalks elongate, the leaf stems also grow, and the plant ultimately reaches a height of eighteen inches. Twinleaf derives its common name from the shape of its deeply divided leaves. Each leaf is about five inches wide by six inches long and is divided into two nearly separate halves, like a mirror image. It resembles a butterfly that flutters atop its slender stem. When the leaves first emerge from the soil they are a unique, rich coppery red. The copper color slowly fades, and the foliage takes on a chalky, blue-green hue. Twinleaf makes a significant contribution as a ground cover in the woodland and home garden, adding bold texture and unusual form. The only other species of twinleaf in the world occurs in the woodlands of eastern Asia. This species, Jeffersonia dubia, is similar in many respects to its American counterpart. Its flowers, however, last up to two weeks and are a remarkable soft lavender-blue. The plants are about six inches in bloom, with the leaf stalks ultimately growing to twelve inches. The leaves of J. dubia are not as deeply divided as our native twinleaf and, although lovely, have a less pronounced effect as a ground cover. Horticulturalist William Bartram named Jeffersonia in honor of his friend, Thomas Jefferson. The bloom time of Jeffersonia roughly coincides with the President's April 13tthbirthday. Although it is considered poisonous, twinleaf has been used throughout history as a medicine. Native Americans used it in poultices and infusions to treat a variety of ailments. Traditional Chinese medicine used it as a treatment for the stomach and fevers. Jeffersonia is notoriously difficult to propagate by division since it grows from a very dense crown. Happily, it grows easily from seed. I grow both species in my gardens and have found that J. dubia reseeds itself more energetically than our native twinleaf. I move some of the tiny seedlings to new locations or grow them on in nursery beds. J. diphylla spreads less readily and new seedlings take years to produce flowers, but, for me, the eventual blooms are more momentous due to the wait. As is the case with most woodland wildflowers, Jeffersonia is most successful in home garden situations that mimic its native habitat: deciduous woodlands with rich, moist, calciferous soils. In the home garden, it requires shade, but adapts very well to drier conditions once established and will thrive in soils within the normal range of acidity. No garden should be without the delicate beauty of its spring blossoms and the presence of its unusual and aptly named leaves. You can purchase twinleaf locally from Garden in the Woods in Framingham and from online sources such as Mason Hollow Nursery, www.masonhollow.com. There are hundreds of species of flowers that are native to the woodlands of northeastern North America, and nearly 90% of them bloom in the spring. Woodland perennials take full advantage of conditions that are conducive to flowering, by blossoming before the forest trees leaf out. At this time the soil has thawed and warmed, and the rays of the sun can still reach the forest floor. The first to bloom is always skunk cabbage. It blooms before most pollinators are available, so pollination is accomplished by flies that are attracted to its fetid odor. The next to bloom is usually hepatica, a small woodland perennial whose blossoms span the time of available pollinators, relying on flies as well as early bees, beetles and moths. Its clumps of bright white, blue or purple daisy-like flowers have a delicate scent. This little woodland gem is surprisingly under-used in the home garden, even though it is very noticeable in bloom, very easy to grow and very long-lived. The genus Hepatica is made up of ten species that occur in the temperate woodlands of North America, Asia and Europe. H. nobilis, H. acutiloba and H. americana are native to North America. They are all evergreen, with three- to seven-lobed basal leaves that may be purple beneath and are often marbled or speckled with silver on top. Leaves may be up to three inches wide on plants that range from three to six inches high. Hepatica is also known as liverleaf. The perceived resemblance of its leaves to the liver has given it its common name and its botanic name: “hepar” is Latin for liver. Although it is considered a poison today, hepatica leaves were used in the past to cure liver and kidney ailments and to soothe coughs. In the late 1800s, the US was a leading producer and exporter of hepatica leaves for use in herbal remedies. Unlike most woodland wildflowers, hepatica leaves are evergreen. In the spring, flower stalks emerge from the center of the previous season's basal leaves. The flower stalks are covered with hair, making them appear furry. Like the fur of animals, the hairs protect the hepatica from frost. The difference is that animal fur acts as protection by holding in body heat, but on this plant, the hairs prevent ice condensation, thus protecting this very early-bloomer from the damaging frosts of cold nights in early spring. Hepatica flowers last for weeks. The petals are actually sepals, each with three bracts. The number of sepals can vary from six to twenty. Older clumps have up to thirty flowering stems covered with silky hair. When the flowers have passed, new leaves emerge, also covered with a downy fur. As the leaves unfurl, they become a shiny, leathery green that darkens with age. The first time I saw hepatica was at Blanchette Gardens nursery. I was immediately attracted to its leaves, with their unique shape and attractive marbling. It wasn't in bloom at the time, and I really did buy it just on the basis of the foliage. That was about 20 years ago, and I have grown to love this little plant in all its stages. It is the first perennial to bloom in my garden and it seems to glisten as the spring sun reflects off its furry stems. Its fresh green leaves with silver marbling remain an attractive presence in my shade garden right through the winter, when the leaves flatten and hug the ground. In my garden, it grows in the shade between an oakleaf hydrangea (Hydrangea quercifolia) and a yellow waxbells (Kirengoshoma palmata), in a bed that includes foam flower (Tiarella cordifolia 'Brandywine'), assorted ferns and numerous hosta and epimedium cultivars. It is very low maintenance. The only attention it receives is a top-dressing of compost and the occasional addition of lime, since it likes soil more neutral than mine. Hepatica is a beautiful and unique addition to the home shade garden. It prefers conditions that mimic deciduous woodlands: humus-rich, moist, but well-drained, neutral soil, in partial shade. It is a true sign of spring, blooming well before most other garden perennials. Its bright flowers and light scent seem like a tonic after a long winter. And its lovely, leathery leaves continue to attract attention well into fall. Spring is the season we all await impatiently. During this time of year, I can be found scouting my gardens nearly every day, searching for the slightest hint of new green growth pushing up through the bare earth. Already, there are crocuses and snowdrops in bloom in my gardens and in just a few short weeks, the early spring ephemerals will be in full force with their delicate and fleeting beauty. Bloodroot is one of the first of these early bloomers and it is also one of the loveliest. Pure white, upward-facing flowers and thick, grayish-green leaves grace this beautiful, yet rugged, woodland perennial. Bloodroot (Sanguinaria canadensis) derives its name from the dark red sap contained in its foliage and rhizomes. This sap makes Bloodroot unpalatable to deer. It is native to eastern North America, from Canada south to Texas and Florida, and is hardy to Zone 3. In its natural habitat, it thrives in deciduous woodlands, where spring sunshine is followed by dappled summer shade. Although it prefers rich, moist soil high in organic matter, it can adapt to a wide range of soil and moisture conditions, making it ideal for shady spots in the suburban garden. It does not tolerate soggy or extremely dry conditions. It spreads by fleshy, orange rhizomes that lie one to three inches below the soil surface. It also spreads by seed and can form extensive swaths in the woodland. Bloodroot is one of the many woodland wildflowers whose seeds are spread by ants, a process called myremecochory. Ants gather the seeds and store them in underground nests where they feed upon a fleshy appendage attached to each seed. In this way, the ants essentially plant the seeds in an environment where they stay protected until they germinate the following spring. When Bloodroot first emerges from the ground, each flower bud is wrapped tightly by a single leaf. As the leaf unfurls, it folds in half and gently clasps the flower stem. The flower stem pushes upward past the leaves, and the bud opens to reveal snow-white petals on flowers that are two inches wide. Individual flowers drop their petals within a few days of fertilization, but the leaves continue to expand to five to eight inches, creating a unique, bold-textured ground cover of deeply lobed foliage that lasts well into autumn. Bloodroot is easy to grow by planting divisions of its fleshy rhizomes in spring. It will also spread in the home garden by self-seeding. Two noteworthy forms of our native Bloodroot are the single-flowered pink form and the double-flowered white form (S. 'Multiplex'). The flowers of S. 'Multiplex' resemble miniature water lilies that seem to float above the foliage. The flowers are sterile, longer-lasting and stunning. The pink form has deep pink buds that open to light pink flowers. Plus, the stems of the leaves and flowers are a rich, dark pink. Both forms prefer shaded, woodland conditions and both perform well in the home garden. In my gardens, a sizable patch of Bloodroot grows between a large-leaf rhododendron and a variegated dogwood (Cornus kousa 'Wolf's Eye'). I can see the single white flowers of the Bloodroot from my living room window. I know they won't last long, so I make sure I get out there on a sunny day to enjoy their simple elegance. In summer, the large, lobed foliage plays nicely with hosta, pulmonaria and astilbe. The double-flowered form of Bloodroot grows beneath a large cedar, where its exquisite flowers take my breath away. Its summer foliage is particularly large and holds its own with a large clump of 'Brilliance' Autumn Fern (Dryopteris erythrosora 'Brilliance') and large-leaved hosta (H. 'Deep Blue Sea' and H. 'Three Sisters'). I am still on the look-out for my next acquisition: the pink-flowered form. I know I can make room for it, somewhere. Bloodroot can be purchased from online sources such as Arrowhead Alpines, www.arrowhead-alpines.com. It is also available locally at Garden in the Woods, the headquarters of the New England Wildflower Society, in Framingham. Garden in the Woods opens this year on April 15, a date that coincides with the time that many spring ephemerals, including Bloodroot, have emerged from winter dormancy and carpet the woodlands with their elegant beauty.